We’ve been pretty spoiled these past eight years. I mean, Barack Obama hasn’t been perfect; who is? But having his intelligent self in the White House has been a pleasant shift from the Reign of Dumb that appears to have started with Ronald Reagan and Dan Quayle and has only been getting worse. Despite unprecedented obstruction from Congress, Mr. Obama managed to get a lot done these past eight years, undoing some of the mess made by George W. Bush and Bill Clinton. Sure I’m biased. Voted for Mr. Obama both times, and I seem to get more liberal with every year I continue educating myself about the way the world works. 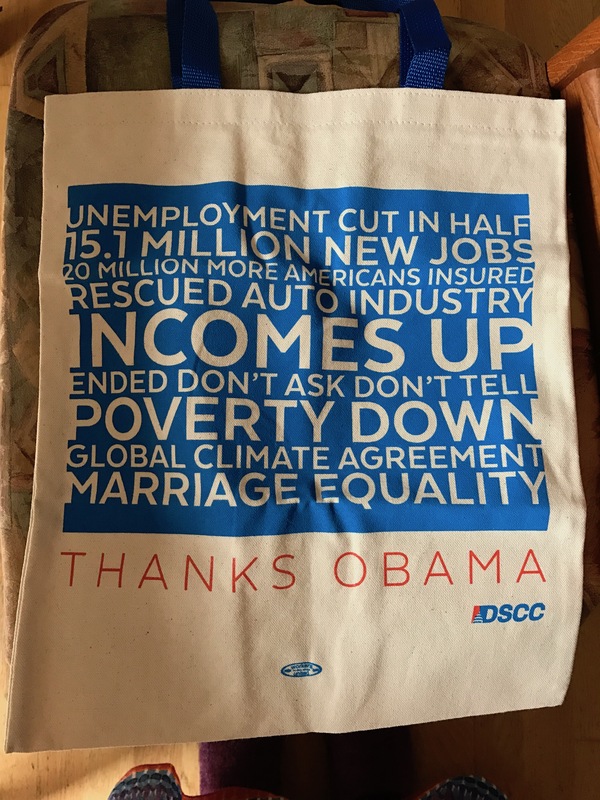 So I’m not sure what else I wanted to say, except Thanks, Obama. 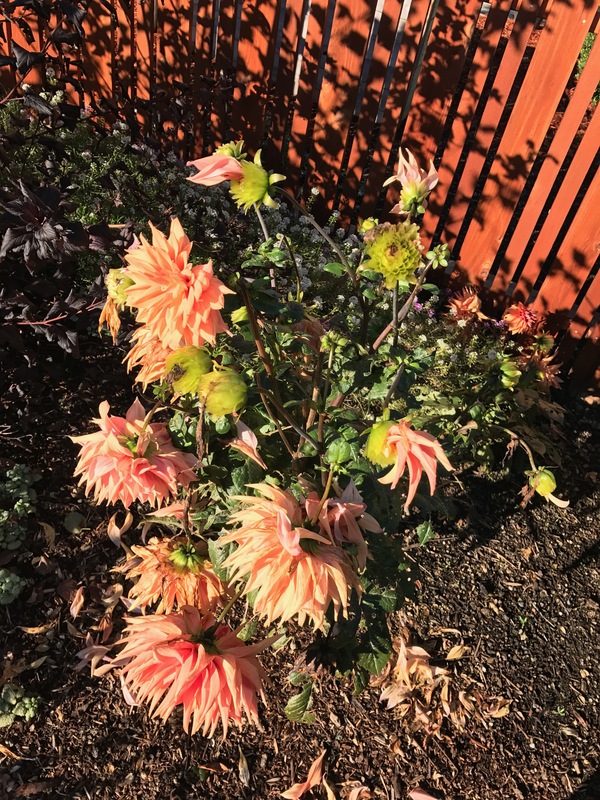 And no matter what anyone says, you are not a cactus. 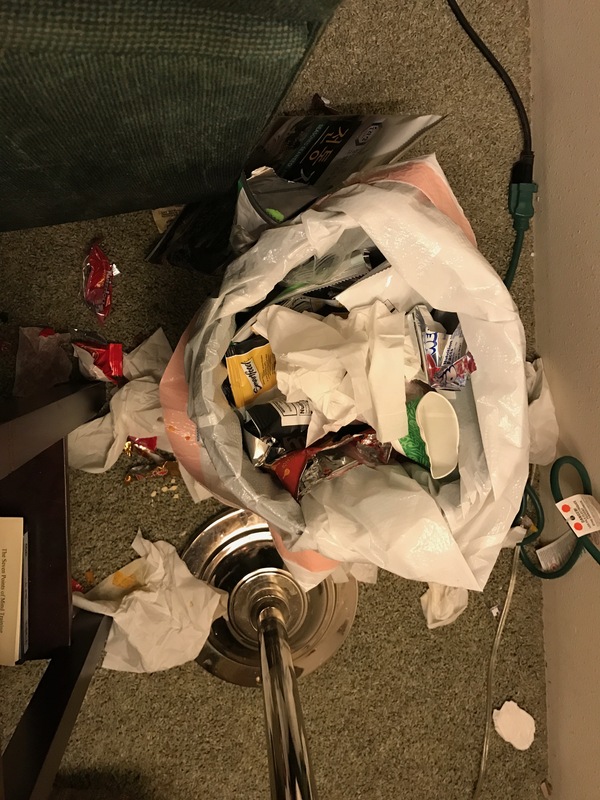 Do you have a trash can like this in your house? Does it blow your mind every time you see it? Do you struggle to lean over the furniture to try to clean this mess up? Do you try to bribe your kid to climb back there and clean it up for you? Do you wonder if your cat is snacking on detritus? 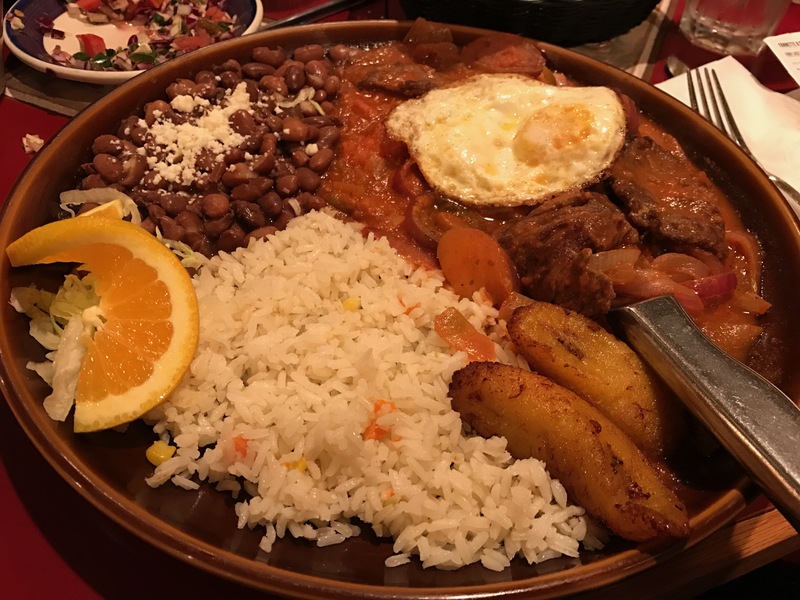 Billed as a “Traditional Colombian Dish,” I got this lovely platter of food at Las Espuelas, one of my favorite Mexican restaurants. I guess there’s no need to ask why a Mexican restaurant is serving Columbian food. After all, I’ve seen a place that serves both Japanese and Korean food, and one that serves both Indian and Chinese food. Additionally American food is often slipped in to the menu of just about any ethnic restaurant. Anyway, the dish was excellent, and now I have an excuse to direct you to a favorite song about Columbia. 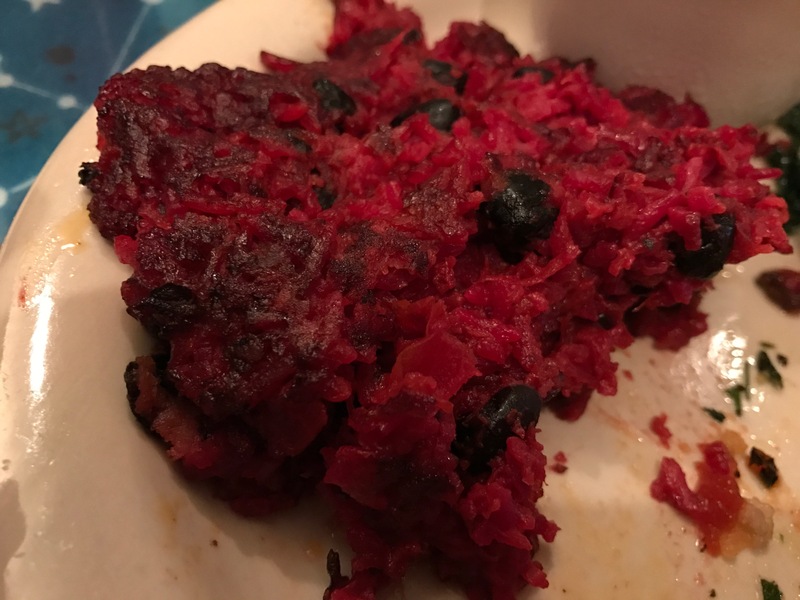 I went to the North Star Diner and ordered their vegan meatloaf. It was billed as being made of rice and black beans as I recall. When I received it, I was surprised to see its color, which to me indicates a heavy presence of beets. How did it taste? Well, I had no complaints. Since the gravy that normally comes with it is not gluten-free, they gave me a side of their smoky ketchup instead and that was pretty good with it. The dish also comes with potatoes, cauliflower and carrots. Ok, so this time I tried to cook my own “new food,” and I will admit it didn’t go as well as I had hoped. First, I went to the store in search of brisket. The only ones they had were super expensive and too big to fit in my giant crockpot. So I ended up getting some other cut of meat (I don’t remember what it was, but it was wrapped in string). Then I applied onions, garlic, cumin, ginger, cinnamon, lime juice, and orange juice to the meat and cooked it on low for 8 hours. 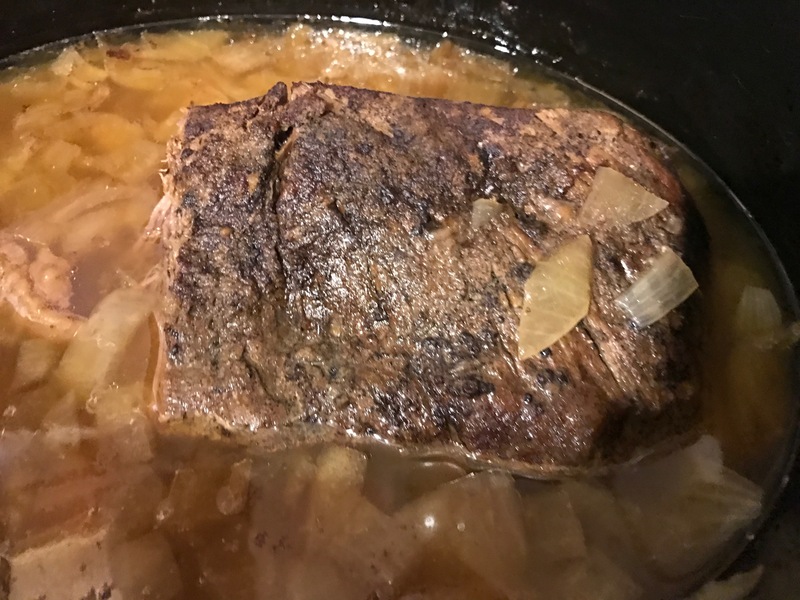 I’d made a lot of beef slabs in the crockpot and this came out the same as any of them…it was doing that “tender yet dry” thing that meat tends to do when slow cooked. So what made this “Cuban” anyhow? I’m guessing it was the seasonings, particularly the lime. I mean, you add lime to rum and coke and it’s called a “Cuba Libre,” and the mojito cocktail is also lime-centered. In case you are curious, the recipe I attempted was Slow-Cooker Cuban Brisket Taco Bowls. But feeling a little fried, all I did was cut up the meat, put some avocado and salsa over it, and eat it with tortilla chips. Fail! I will try to do better next time. If 9/11 was the day America learned that foreign terrorism had come to US soil, 11/9 was the day American learned that domestic terrorists — following the example of President Elect Donald Trump — were coming out of the shadows and feeling justified in attacking people different from themselves. (If you don’t believe this, Google “trump’s america day 1”.) But this isn’t a depressing post about hate, or about denigrating people who fear-bully those different from them. It’s about celebrating the diversity of yum! I’ve always been a somewhat adventurous eater, but yesterday I resolved to try…new foods! The majority of them will be “foreign” foods, at least to me. And I’m going to do this for at least thirty days, though I cannot guarantee all the days will be consecutive. I’ll start the challenge with the food I ate yesterday, a Poke Bowl purchased at Central Market. I found this one to be very, very salty. Now, I know I can’t judge something like this from a supermarket grab and go, but if I had to describe it in a nutshell I’d call it a Korean-style Chirashi bowl. (Sorry cringing Hawai’ians). Anyway, let’s learn more about it. 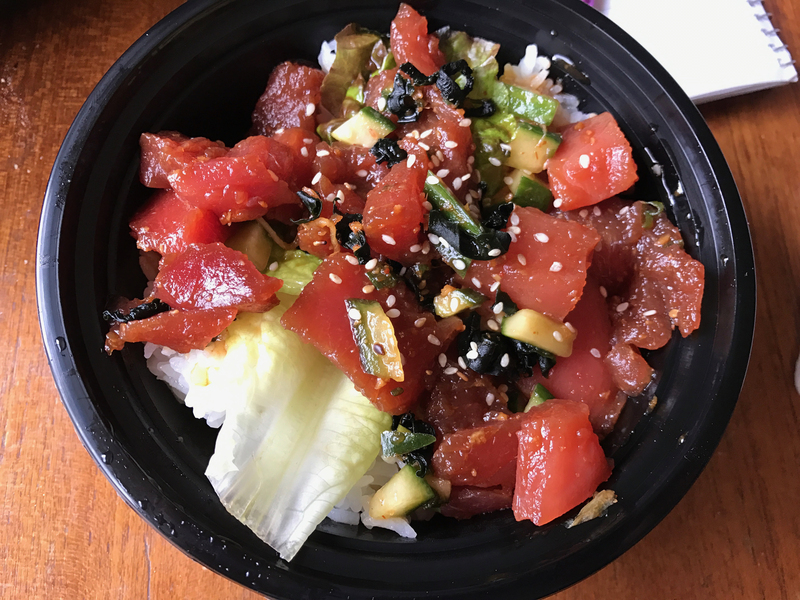 Poke (pronounced “POH-keh”) is a dish from Hawai’i. It is usually a bed of rice with raw fish and veggies on top. There are a lot of different combinations you could come up with. The one I got seemed pretty classic, but what do I know? If you’ve got more poke experience, or recommendations for where I can get some awesome good poke in Seattle-town, please comment. Autumn leaves? Never you mind that. 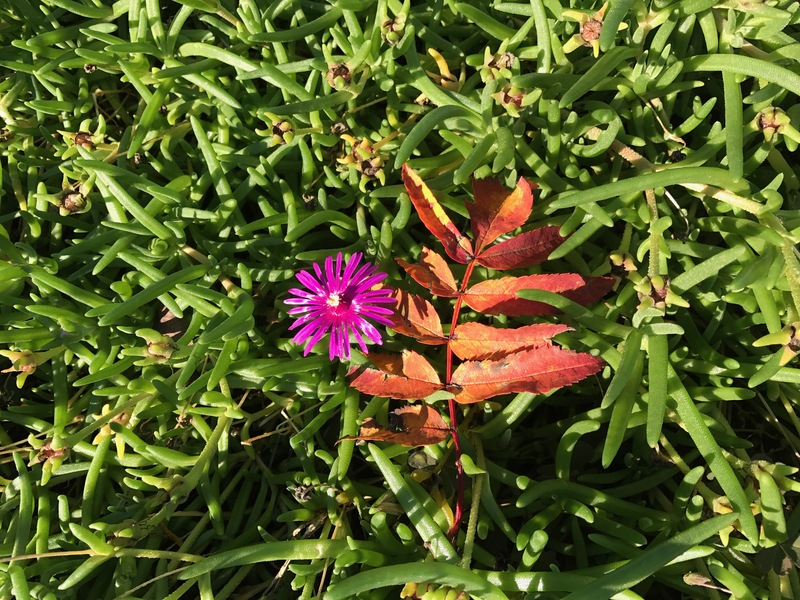 Ice plant still has flowers. 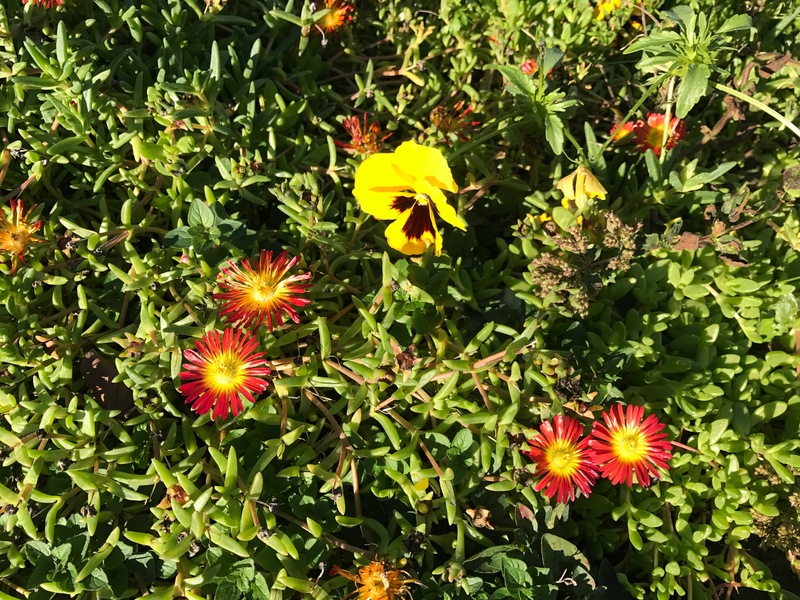 Pansies are up for another round, while Ice plant keeps on blooming. 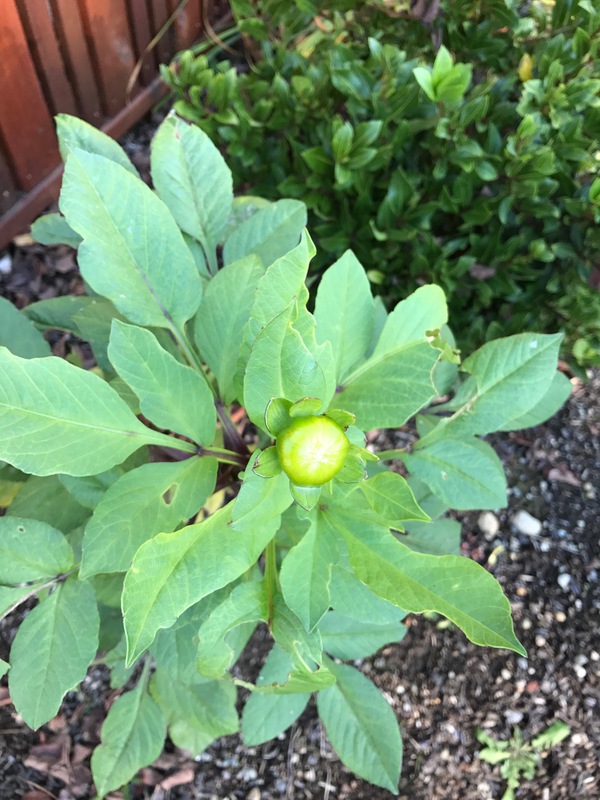 Dahlia has not bloomed yet, and that flower bud has been staging itself for days, shyly refusing to open. 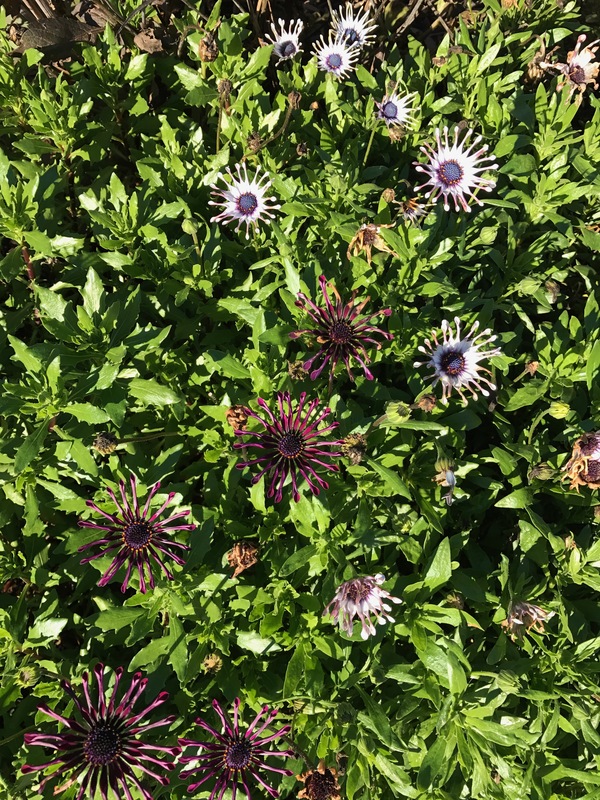 I can’t remember the name of this cool flower but it has not stopped blooming since spring. 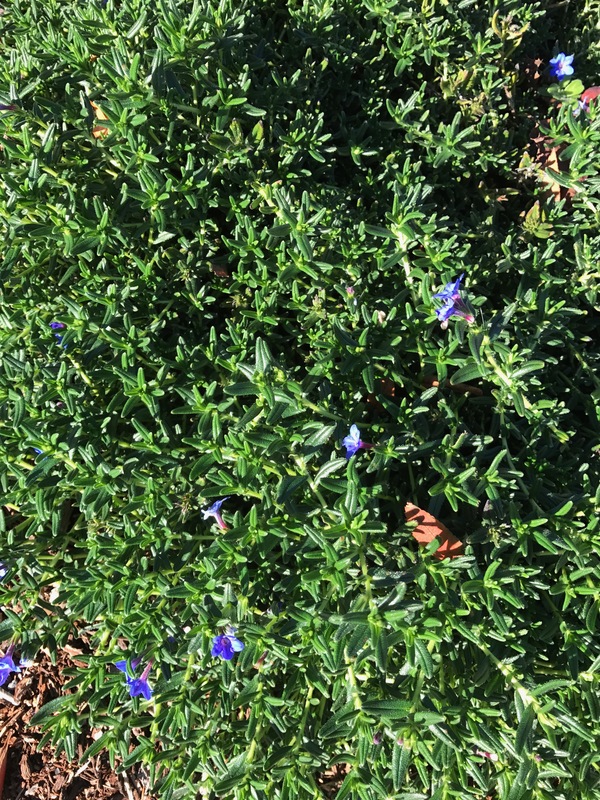 Lithodora, back for another round.